Welcome to our gallery featuring splendid hot tub gazebo designs. One of the most relaxing things you can have in your yard is a hot tub. A hot tub draws people to your home and serves as a place for you to kick back and let all troubles melt away. 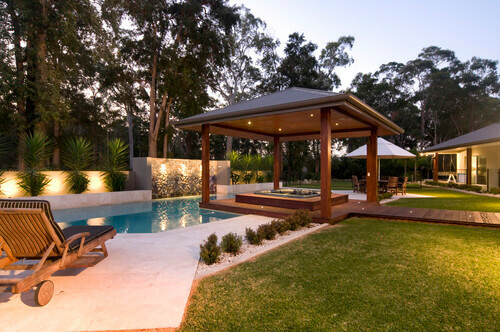 To really make your hot tub stand out you may opt to build a gazebo around it. 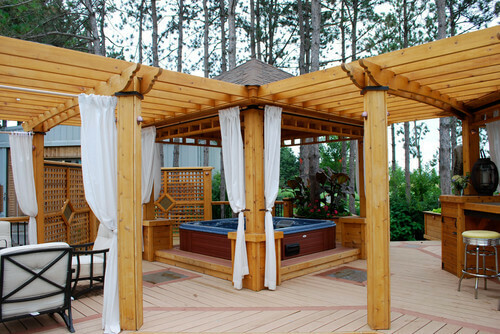 A nice relaxing hot tub covered by a gazebo will extend the hot tub’s usage. You can have a lovely romantic evening in the hot tub even if rain is coming down, or even while it is snowing. What could be more atmospheric than that? 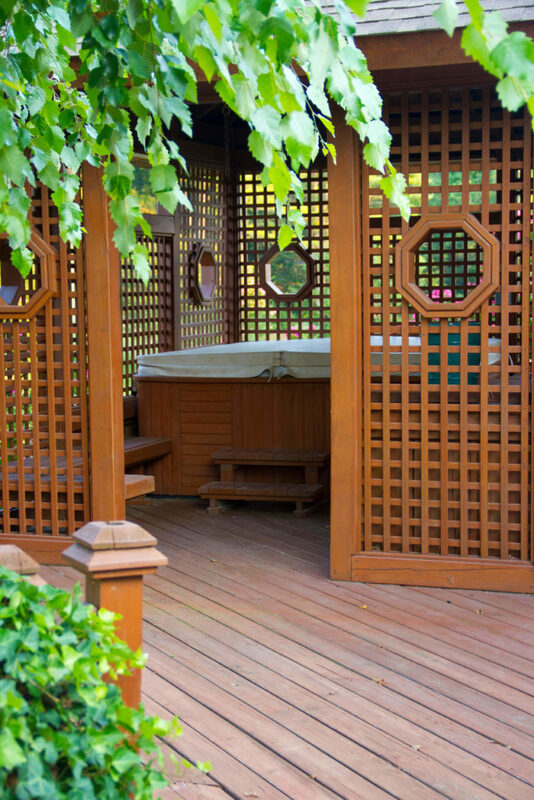 When pairing a gazebo and a hot tub, you should find two that go well together to make one unified relaxation spot. What are the pros and cons of putting a hot tub under your gazebo? Entertainment spot – With your very own hot tub your space will become the toast of the town and everyone will be clamoring to come over for a dip. You will have the ultimate hangout spot for socialization and relaxation. 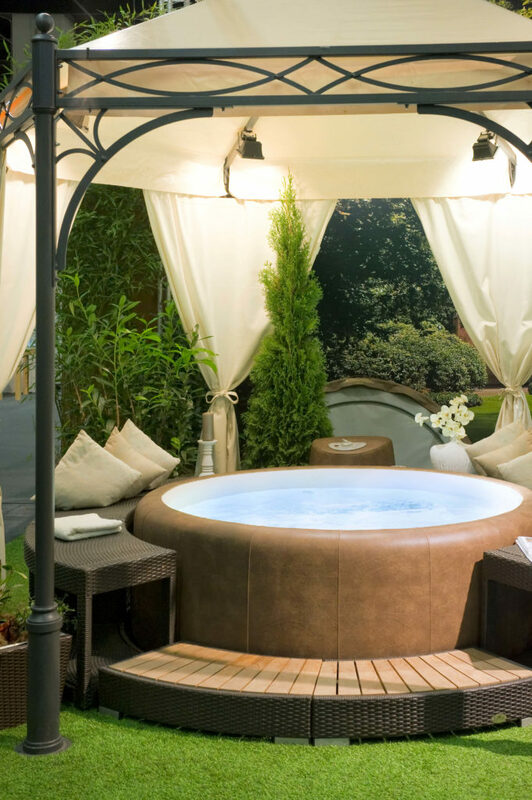 All weather use – When you combine the fantastic powers of a hot tub with a gazebo you have a relaxation spot that can be open in all kinds of weather. 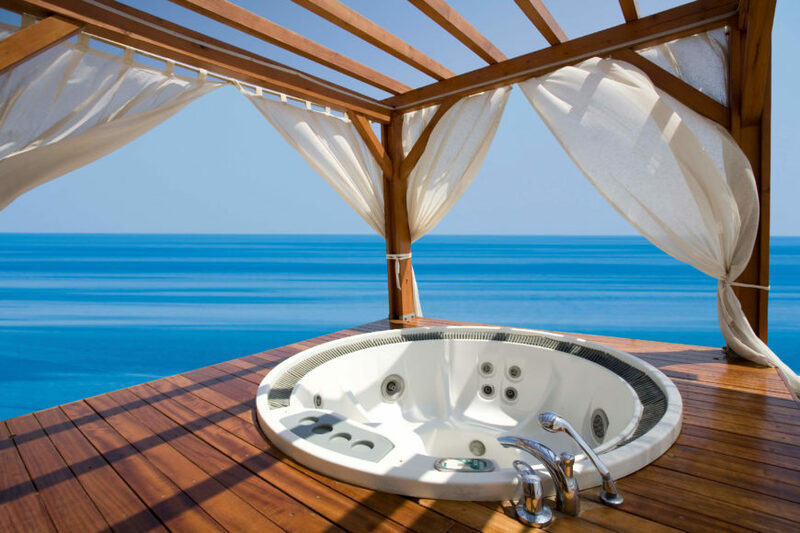 Maintenance – Hot tubs require upkeep to stay clean and free of bacteria. The water in a hot tub can be the perfect environment for bacterial growth so it is important to be careful and stay vigilant with regular maintenance and cleaning. Cost – Hot tubs cost a fair amount to install. They also have upkeep, cleaning, and maintenance costs. All of these expenditures can really add up over time. Limiting the gazebo – Gazebos are often very versatile structures that can be easily retrofitted for different uses on short notice. When you include something such as a hot tub you may be limiting the use of your gazebo. It may be strange to stage a wedding around your hot tub gazebo. 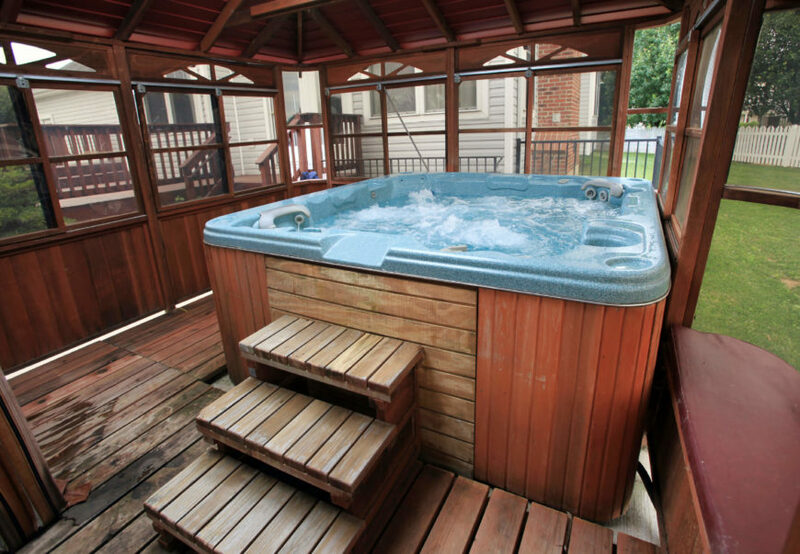 This hot tub has been integrated into the porch and deck and sits under a great gazebo. This provides additional shade on hot days and unites the hot tub area with the rest of the house. 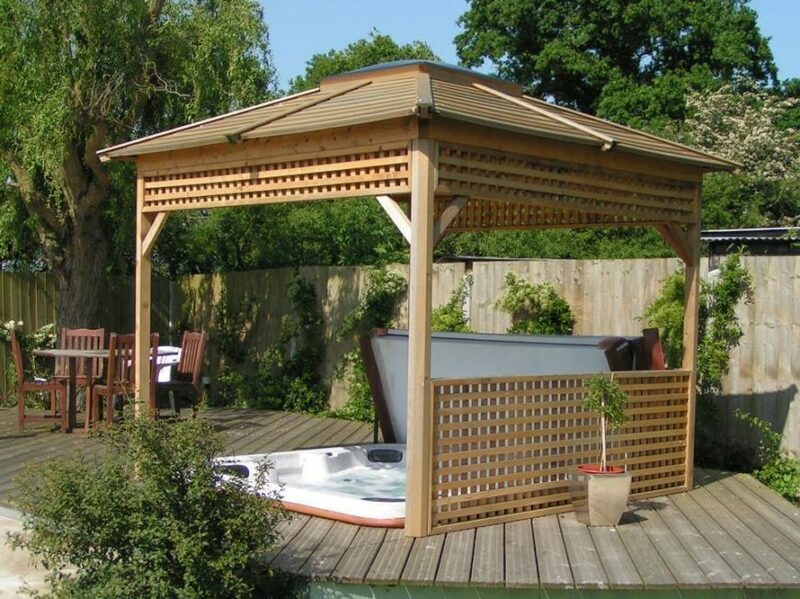 This fabulous gazebo houses not only a lovely stone hot tub but a set of patio furniture as well. 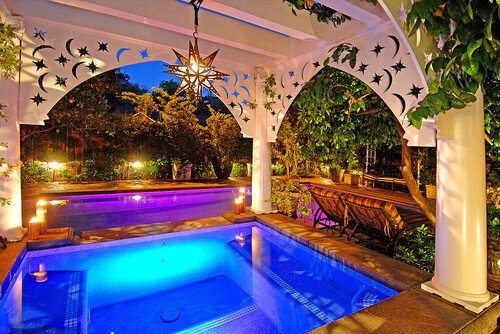 This would be the perfect place to hang out, relax, and, if the mood strikes, jump in the hot tub. 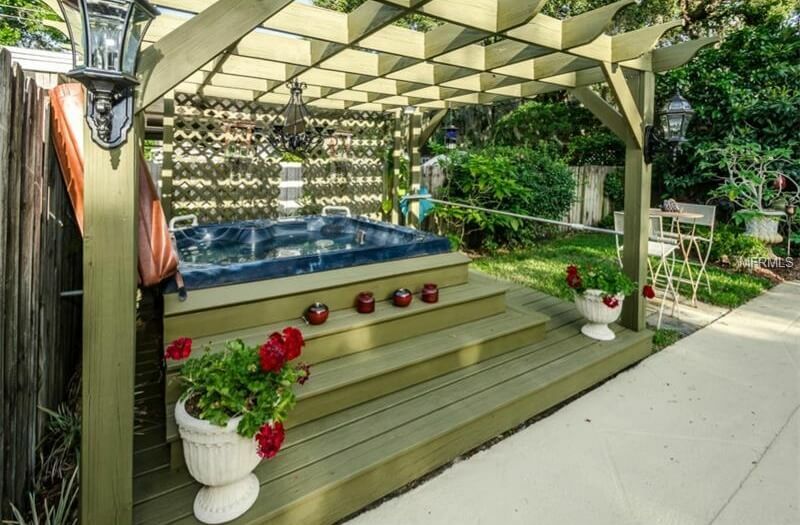 This gazebo is just spacious enough to house this hot tub. It is the perfect cover of shade on hot days and protects against the rain and snow on such occasions. Traditional Patio by Brenham Landscape Contractors Glasco & Co. Landscaping, Inc. 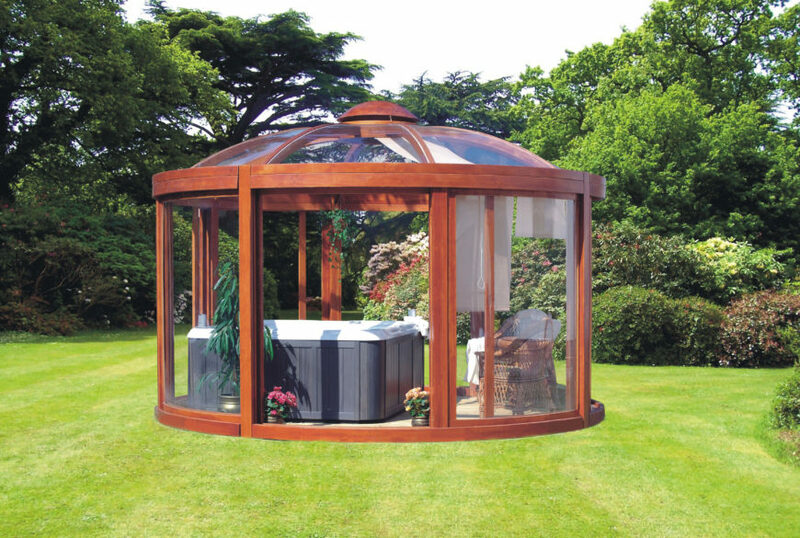 This enclosed hot tub with a glass paneled gazebo is the perfect space for looking out over your property in comfort and relaxation. Your vision will be slightly impeded but you will have protection from the weather. This gazebo and deck on the water is equipped with a hot tub as well as curtains. Curtains can be used as decoration or to increase privacy. 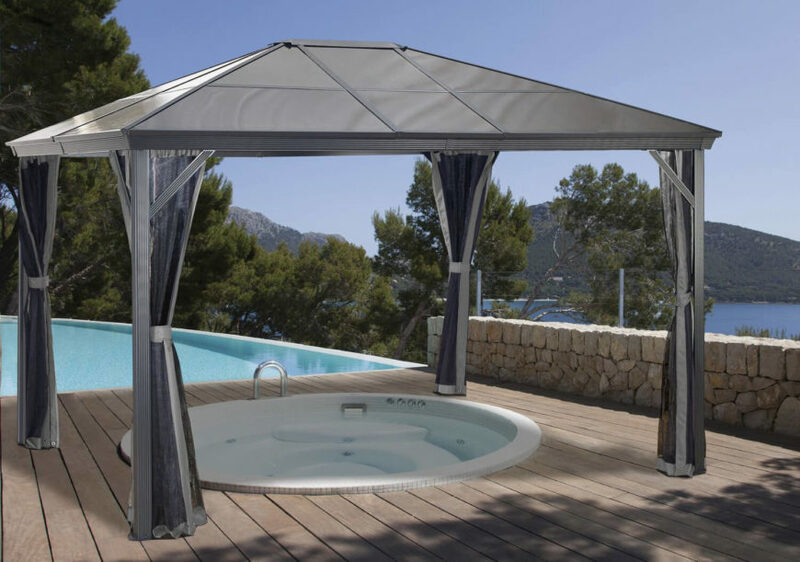 This cloth top gazebo is a great piece for putting over a hot tub. You can place it there when you need it, but it can also remain closed when you no longer need the covering. 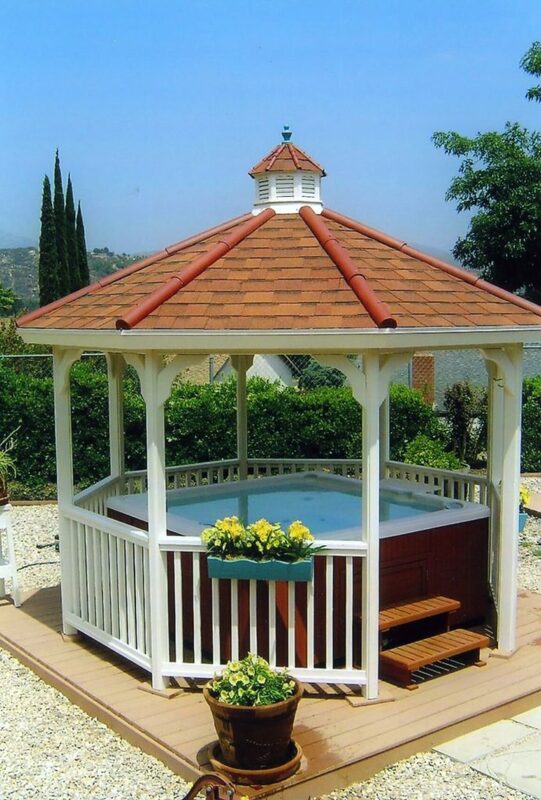 This piece combines both hot tub and gazebo together. The covered gazebo is perfect in all kinds of weather and includes shades for privacy as well. 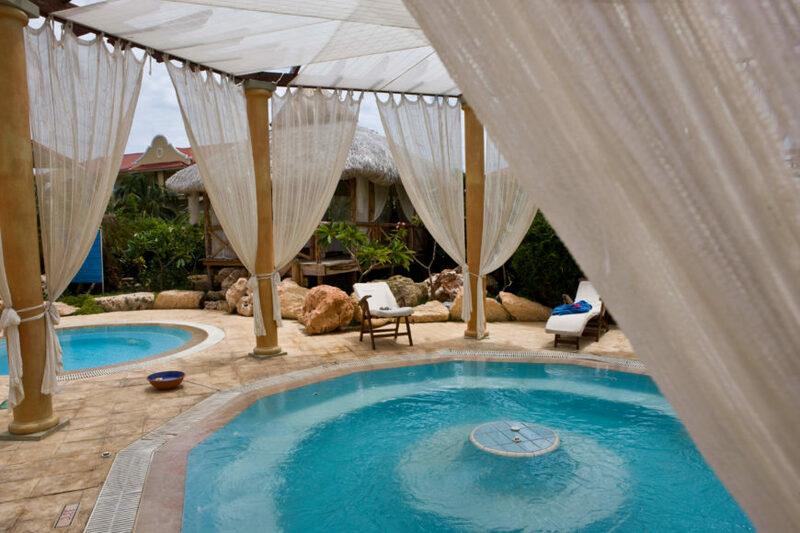 After a nice refreshing swim, it would be wonderful to follow it up with a warm up in this hot tub. The gazebo provides cover but the lighting elements in the ceiling also illuminate the area. 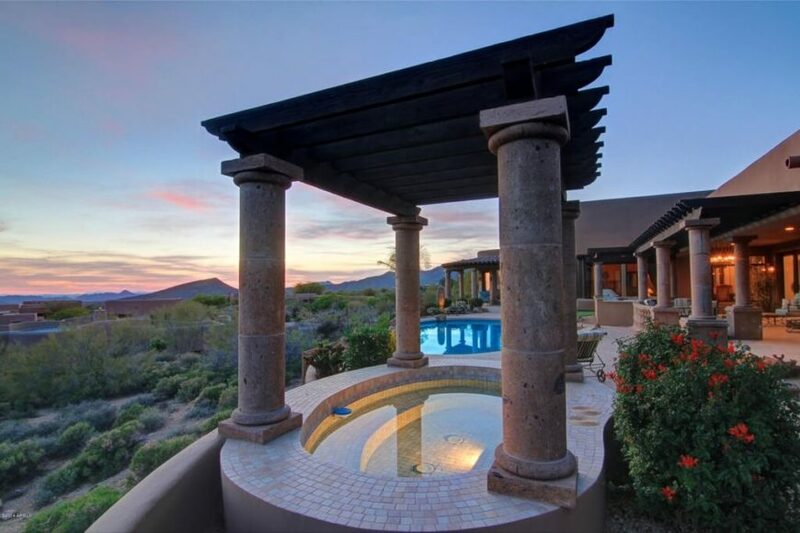 This large space is an elegant and sophisticated gazebo with a private hot tub right in the center. The curtains between the pillars are great decoration that give the space a breezy and relaxed appeal. This cozy hot tub is a perfect spot for a nice soak. The gazebo around it makes this spot even more warm and welcoming. 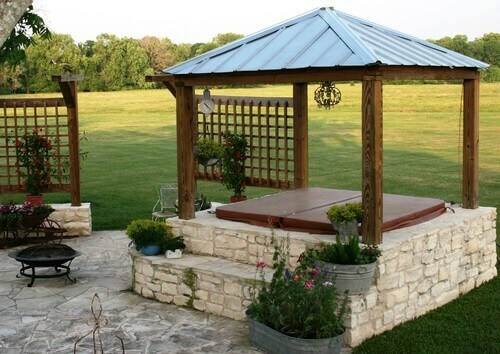 This beautiful wooden gazebo is a great addition to any yard for any reason. It also turns out to be the ideal size and shape to house a nice above ground hot tub. 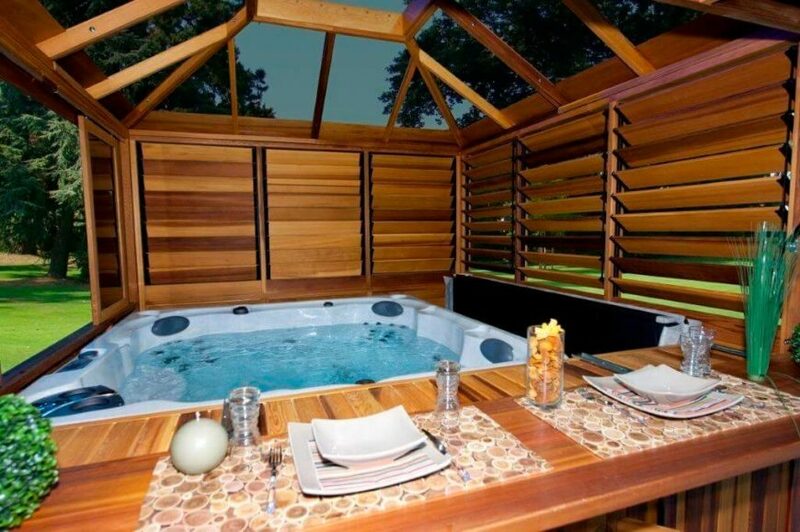 This hot tub space is a fantastic getaway for anyone who wants to escape from the world. 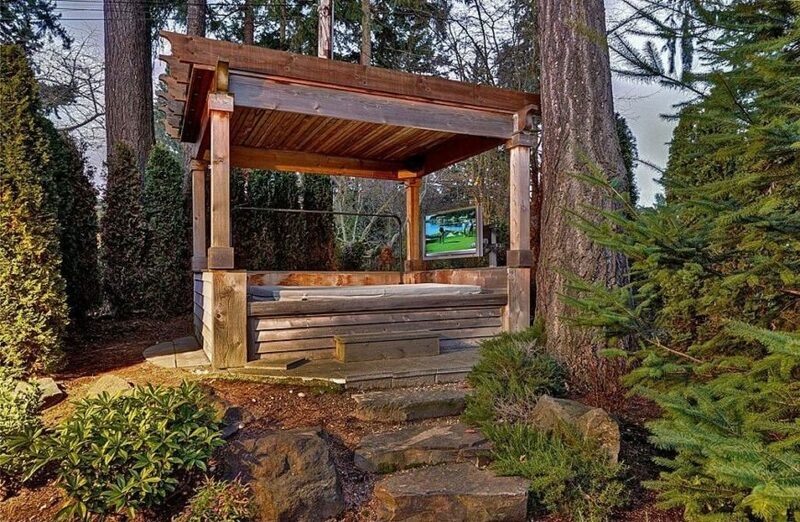 This gazebo has multiple different sections, one of which is dedicated to housing a hot tub. The portion housing the hot tub has a full roof to keep the space protected from the weather. 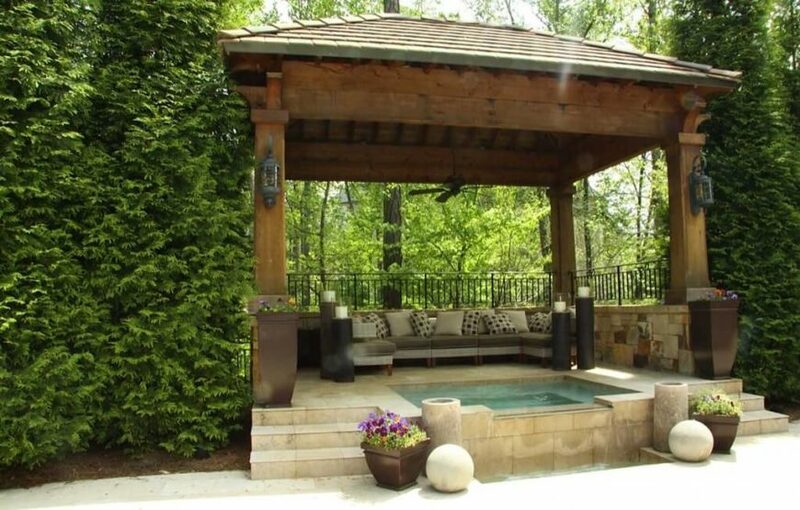 This gazebo has fences to create an isolated and solitary hot tub space. This makes for a great spot where you can escape to shut yourself off from the world, even if only by a bit of fencing. When you are able to fit a hot tub as well as a seating area under your gazebo, you effectively create a hang out spot. People can visit and soak in the hot tub or socialize while sitting on the sofa. With this setup,those either inside and outside of the hot tub can socialize together. This is a nice shady escape where you can can lay back and let your worries drift away. 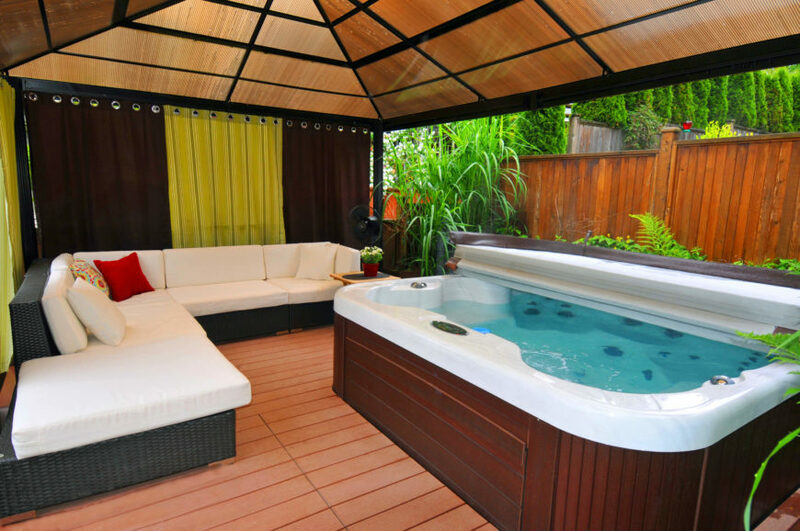 Adding candles and flowers transforms this hot tub space into the perfect romantic getaway in your own backyard. This hot tub with soft sides and extra seating is a comfortable piece for hosting a get-together in the warm water. 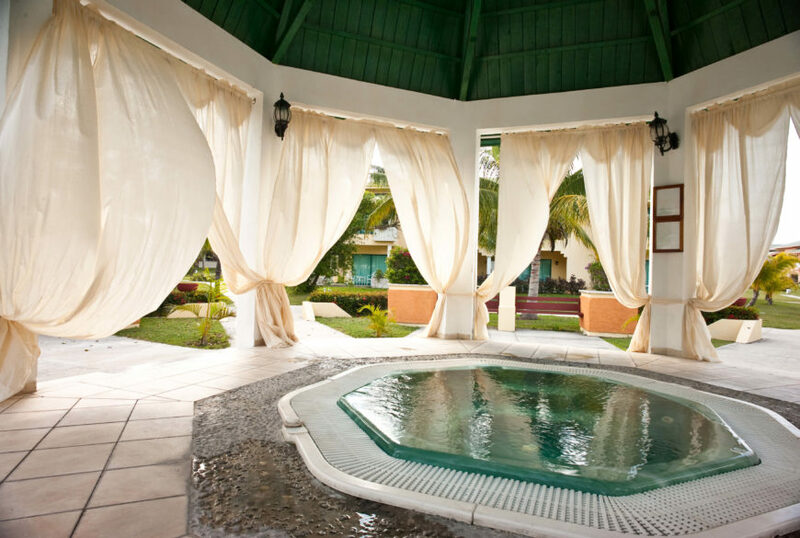 The cloth domed gazebo above the hot tub has an elegant design, making this area more welcoming. A gazebo is a great way to hang lighting fixtures in areas that need more lighting. This hot tub is enhanced by the chandelier above it. 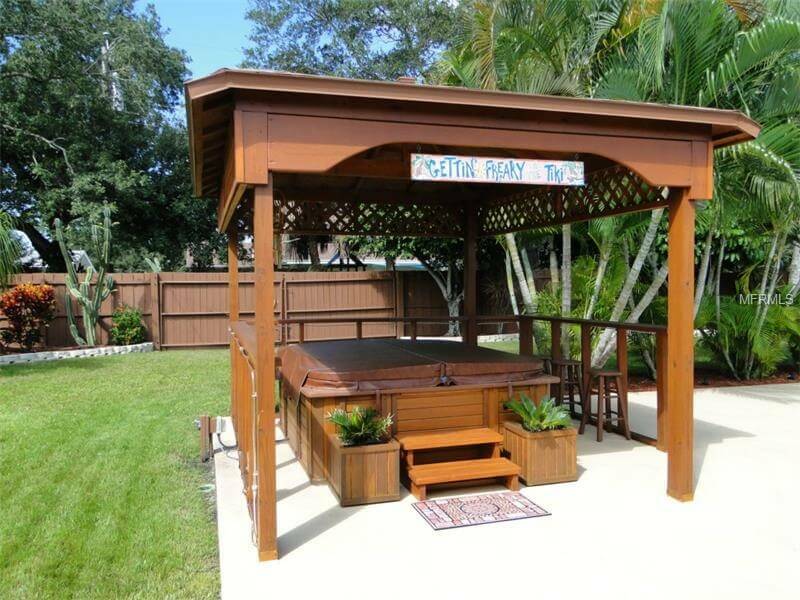 This gazebo is built to fit snugly around this hot tub, creating a cozy and private retreat to enjoy the water. With glass tops you can lay back, relax in privacy, and watch the stars. 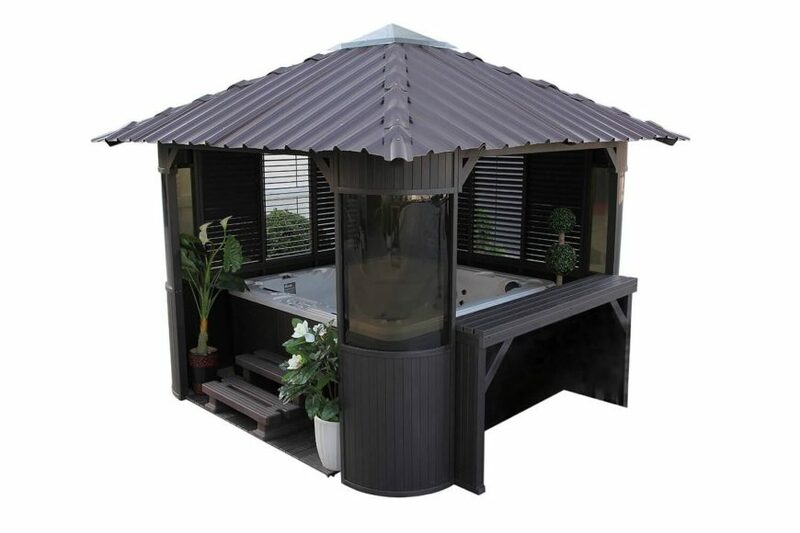 The hot tub and gazebo combo can be elegant and have a high end luxury appeal. Use designing features to build a fantastic elevated space for yourself. 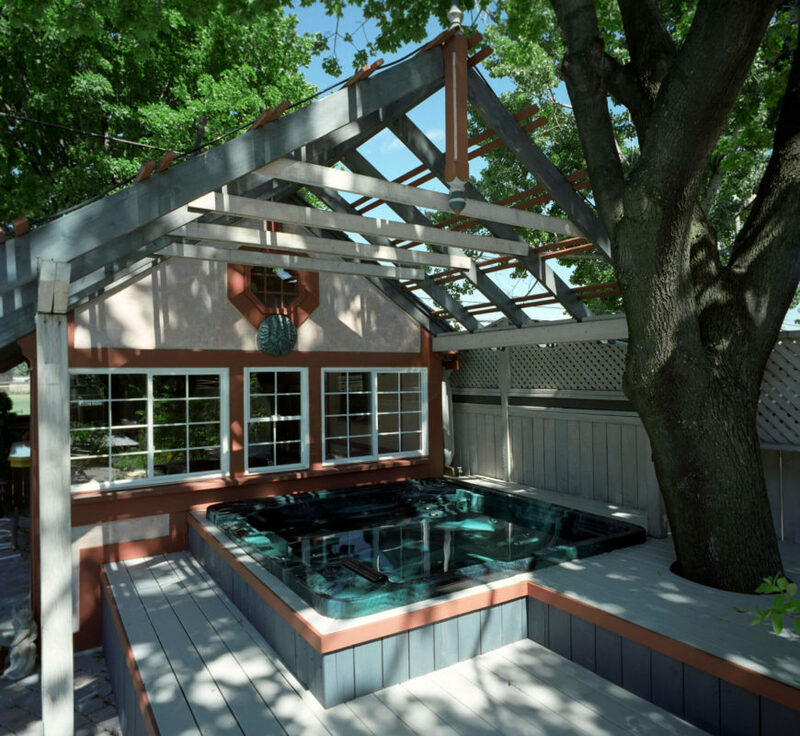 This above ground hot tub is built into the deck and topped with a walled gazebo. 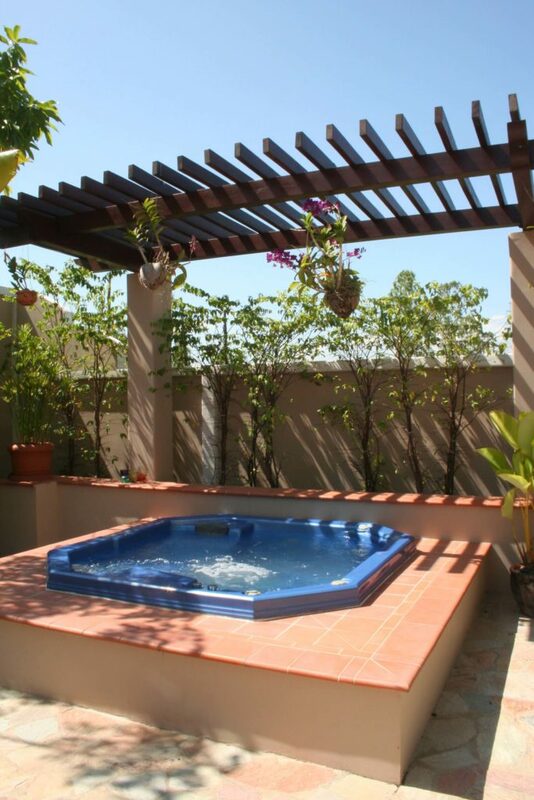 Creating a private and intimate space for your hot tub makes the area welcoming and cozy. While a gazebo can build privacy, it can also work to divide and separate your space. 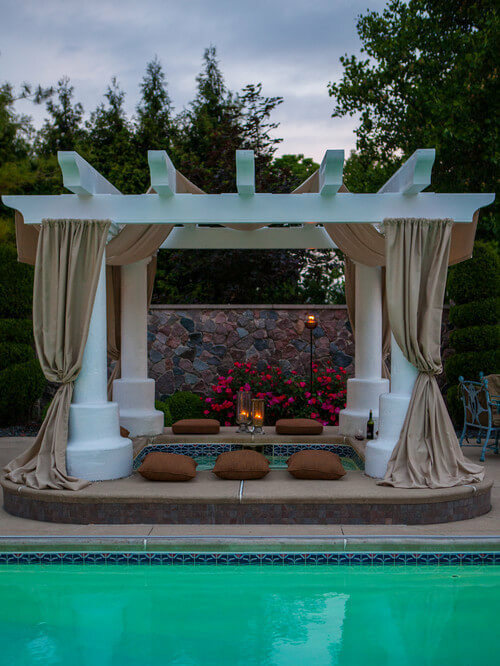 Draping curtains from your gazebo and adding pillows and candles can transform your hot tub into an elegant romantic destination for you and your significant other. Mediterranean Pool by Fort Wayne Furniture & Accessories CDI: Choice Designs, Inc. 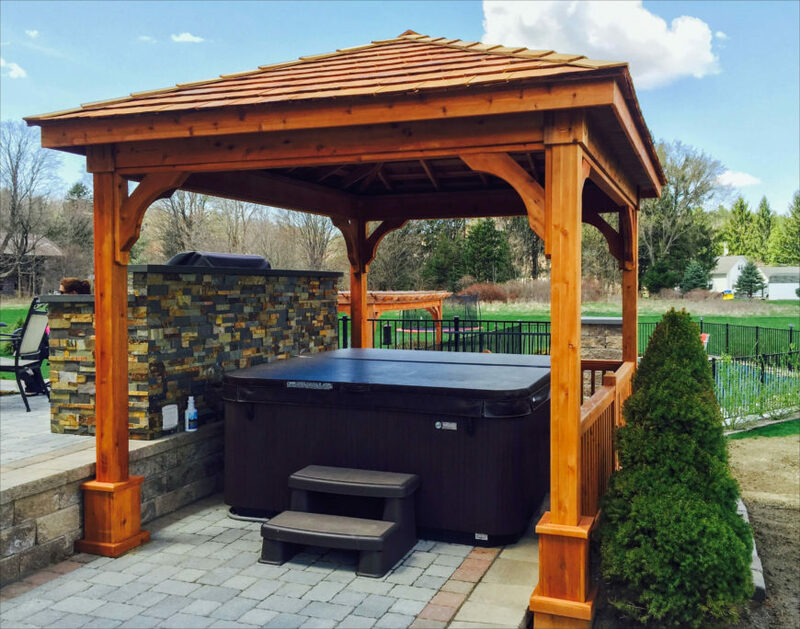 This natural wood gazebo and hot tub build a superbly rustic and natural feel within this wooded space. You can even add a modern touch with a television so you can catch your shows while you relax. This hot tub is covered by a portable gazebo. 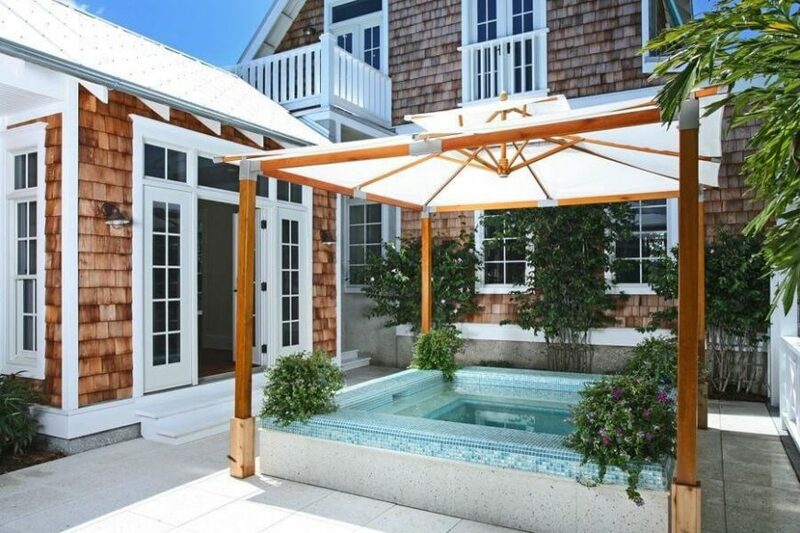 This kind of gazebo is ideal when you don’t always want your hot tub covered. You can remove it when you desire a clear view of the stars, then replace it if you need extra shade and privacy. This wonderfully shady spot is perfect for a hot tub get away. This is the kind of place to go when you want the weight of the day to melt off of your shoulders.